As the tallest animals in the world, giraffes get a terrific view of the African savannah. Adults reach heights of 20 feet, and one kick from their powerful hooves could mean death for a lion or hyena. Giraffes travel in herds, stopping frequently to graze on leaves of thorny trees. They are most vulnerable to attacks from predators while drinking at water holes. A portion of the proceeds from the sale of this little Itsy Bitsies stuffed giraffe goes towards Abhaya Charitable Foundation (USA), a nonprofit organization providing housing, education, and support of disadvantaged children throughout the world. 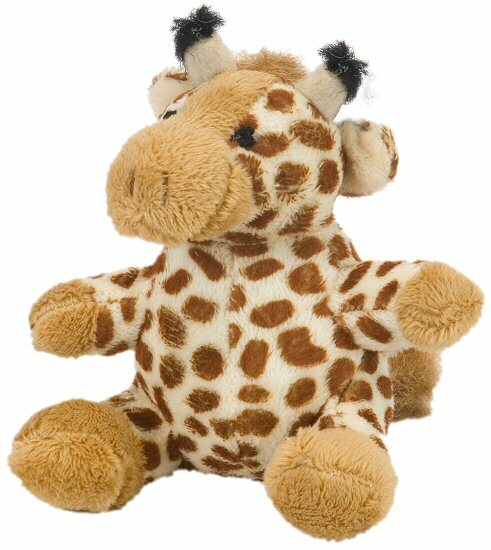 Ginger, this adorable little Cushy Critter stuffed giraffe, has soft giraffe-spotted fur, brown accents, and fluffy brown mane and horn tufts.